Barbara Andersen has been designated a Distinguished University Professor in Psychology. Andersen joined The Ohio State University in 1989 in the Department of Psychology with a joint appointment at the College of Medicine in the Department of Obstetrics & Gynecology. She is also a member of the Cancer Prevention and Control Program at The Ohio State University Comprehensive Cancer Center – Arthur G. James Cancer Hospital and Richard J. Solove Research Institute. She was officially honored with the Distinguished University Professor title on Aug. 31, 2018, along with Steven Ringel, Neal A. Smith Chair in Electrical Engineering. 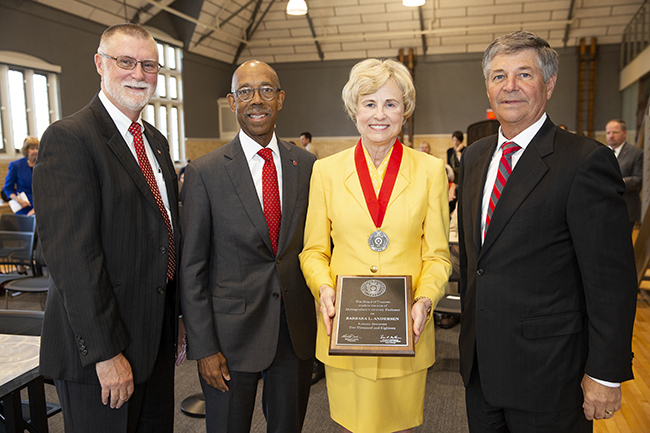 Barbara Andersen, Distinguished Professor of Psychology, stands with (from left) Ohio State Executive Vice President and Provost Bruce Mcpheron; President Michael Drake; and Board of Trustees Chair Michael Gasser. Andersen's research surrounds psychological, behavioral, and biologic (biobehavioral) aspects of cancer as they relate to disease progression. Her recent work includes randomized clinical trials of psychological interventions to: reduce stress and depressive symptoms; improve quality of life, health behaviors and adherence, and health outcomes; improve immunity and reduce the risk for recurrence. Ongoing research in lung cancer and chronic lymphocytic leukemia examines health perceptions and trajectories of stress, depression and immunity and she contributes expertise regarding the assessment of anxiety, depression and quality of life for the Pelotonia-funded "Beauting Lung Cancer - in Ohio" statewide clinical trial. She has disseminated her interventions and trains mental health providers in oncology to deliver biobehavioral interventions, and she has co-authored over 170 peer-reviewed articles and chapters. Professor Andersen is highly active in teaching and service to the profession. In addition to teaching, she mentors pre- and post-doctoral trainees, as well as junior faculty, and she has chaired grant review panels for private foundations and the National Institutes of Health. She has received numerous awards, including Ohio State's Distinguished University Scholar Award (2000) and the Provost's Award for Distinguished Teaching by a Lecturer (2003), and last year was named an Arts and Sciences Distinguished Professor of Psychology. She has received the Award for Outstanding Contributions in Health Psychology from the American Psychological Association (2003); the Peter Minton Hero of Hope Research Champion Medal of Honor from the American Cancer Society Ohio Division (2004); the Distinguished Senior Investigator Award in Cancer from the Society of Behavioral Medicine (2015); and recently, the Outstanding Education and Training Award from the American Psychosocial Oncology Society. She is an elected fellow of the American Association for the Advancement of Science. Ohio State’s Office of Academic Affairs awards the permanent, honorific title of Distinguished University Professor on a competitive basis to full professors who have truly exceptional records in teaching, research, scholarly or creative work and service. One to three appointments may be awarded annually to faculty members who have been at Ohio State for at least five years. Distinguished University Professors automatically become members of the President’s and Provost’s Advisory Committee. In addition, recipients are awarded a $30,000 one-time grant to support their academic work and are expected to maintain a regular program of teaching, research, scholarly or creative work and service.